This tutorial will introduce a free partition magic software to resize disk partition on Windows 2003 when its space is not enough or unreasonable. Download IM-Magic Partition Resizer Server to resize hard drive partition to allocate its disk space reasonably to avoid low disk space issue. Whether you are familiar with Windows Server 2003 operating system or not, you are able to resize hard drive partition on Windows 2003 with help of partition software IM-Magic Partition Resizer Server. You may extend a disk partition or shrink a disk partition by using this partition software. You can also move unallocated disk volume easily with this partition software. IM-Magic Partition Resizer Server has the function of resizing a system partition, boot partition or other partitions no matter its file system is NTFS or FAT32. Download, install and run IM-Magic Partition Resizer Server on computer. Right click a partition that has large free disk space on the hard disk and go to "Resize/Move" option. Shrink the selected partition by moving the arrow, and then you can see free space. The free space will be shown as unallocated volume. Move the unallocated volume close to C partition. Right click C partition and go to "Resize/Move" option. Increase the size of C partition by moving the arrow and click "Apply" button. Then the partition software will extend the C partition effectively within a few seconds. Are You Familiar with Cases Below? Case 1: I am running Windows Server 2003 operating system on my computer. The system is installed on C partition which only has 50GB disk space in total. Now, I am running out of disk space on C partition and I can receive low disk space alert every time I boot my computer. How can I reallocate more free space to C partition without reinstalling system or repartitioning the hard disk? C drive (system is installed on this partition): 30GB in total, only 135 MB left. D drive: 208GB in total, 180GB left. E drive: 120GB in total, 80GB left. F drive: 142GB in total, 120GB left. Well, all above is the detailed information about every partition on my computer. 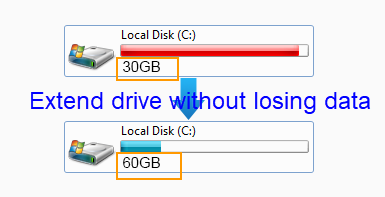 I am wondering if I can move some free space to the C drive from other partitions. As a PC user, you may be familiar with the cases above, or you may even have encountered the similar problem. It is quite common to run into such kind of problem, so you don’t need to worry. Solution is quite easy, and you just need to use a partition resizing software to get the problem resolved. 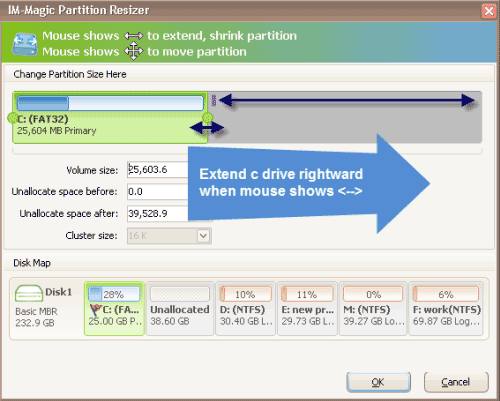 How Does Partition Resizing Software Work? Simply say, IM-Magic Partition Resizer Server is to resize a Windows Server 2003 partition that has low disk space by moving free space from another partition that has large free disk space. For instance, if D drive has the largest free disk space, you need to run IM-Magic Partition Resizer Server to squeeze some free space from the D drive first of all. Then you can continue to use this software to move the free space to the C drive. Of course, it is not a must that you always need to select the partition which has the largest free space. You can select any partition as long as it still has enough free disk space. In order to prevent disk partition from running out of free disk space, it is highly recommended you to allocate disk space reasonably when you divide the hard disk into several partitions on your computer. It is true that it is difficult to know how much space a partition will need before you write data to it, but you had better allocate a large size to C partition because this partition often plays an important role in your computer. When a C partition is lacking of free disk space on Windows Server, you may be now allowed to delete many files from this partition. You may be unable to format this partition, either. Things might be easier if a data partition is full because you can easily move all files on a data partition to another partition or to an external device.